At Catholic University of America in Washington, D.C., officials sometimes bring in low-income applicants and their families for counseling — not to encourage them to come there, but to suggest they consider going somewhere cheaper. The university needs to spend its financial aid to attract “higher-end students,” said W. Michael Hendricks, vice president for enrollment management — the kind of high-achieving, wealthy students universities typically try to entice because they improve prestige and bolster the bottom line. Despite such sentiment, Catholic University charges the highest net price in America for low-income students — that is, the price once discounts and financial aid are taken into account — according to a study by the New America Foundation, based on information reported to the U.S. Department of Education by the institutions themselves. In fact, at a time of escalating worry over access to higher education for the children of the least affluent Americans, the study found that five of the 10 most expensive private universities for low-income students, and 10 of the top 28, are Catholic. Catholic University of America in Washington. Catholic universities are among those charging low-income students the highest prices, federal data show. Photo: Catholic University. Some Catholic colleges “seem to have departed from what you would assume the principles of their faith would have compelled them to do,” said Kati Haycock, president of the Education Trust, a nonprofit organization that advocates for low-income students. Colleges that charge the most to poor families, the New America Foundation researchers said, use their financial aid to attract students who come from well-funded suburban high schools and whose comparatively higher entrance examination scores and high-school grades improve the colleges’ standings in rankings. Officials at some Catholic colleges and universities say that, as a matter of survival, they feel compelled to spread small amounts of financial aid to a large number of students, rather than give more of it to the poor. By making many small grants, they say, they can attract the number of tuition-paying students needed to keep the colleges in business. Some Catholic institutions do succeed at keeping down costs for students with family earnings low enough to qualify for federal Pell grants — generally, $30,000 a year or less. But others are charging those students a net price that is equal to two-thirds or more of their families’ entire annual incomes. At Catholic University, for example, the poorest students pay an average annual net price of $30,770. Philadelphia-based Saint Joseph’s University charges its poorest students $30,503; Saint Louis University, $23,882; the University of Dayton, $21,520; and Loyola University Maryland, $20,672. These schools also enroll low percentages of poor students. Only between 13 and 15 percent of the students they enroll come from families with incomes low enough to qualify for Pell grants. Five other Catholic colleges and universities, however, are among the 10 private colleges at the other end of the spectrum, providing a lower-cost education to comparatively high proportions of Pell students. Saint Thomas University in Miami, for example, has an average net price of $8,072 for its lowest-income students, who make up more than half of its enrollment. Others with high proportions of low-income students and low net prices are Saint Mary-of-the-Woods College and Calumet College of Saint Joseph in Indiana, Holy Names University in Oakland, and Saint Francis College in Brooklyn. “Some Catholic colleges are able to place a high priority on meeting the needs of very low-income families. Others have limited resources, making it more difficult to address those financial needs,” said Michael Galligan-Stierle, president of the Association of Catholic Colleges and Universities. “While embracing their faith tradition, our institutions still must contend with the realities of education costs that are true of any college or university in the United States,” Galligan-Stierle said. In fact, some of the Catholic colleges that charge the most have robust wealth in the form of their endowments. Saint Louis University has a $956 million endowment; the University of Dayton, $442 million; Catholic University, $264 million; Saint Joseph’s, $193 million; and Loyola of Maryland, $177 million, the National Association of College and University Business Officers reports. Among the other Catholic universities with high net prices for low-income students, Villanova University has an endowment of $419 million and Notre Dame, $6.9 billion. Gerald Beyer, a theology professor at Villanova, thinks high-cost Catholic colleges should try harder. While many American non-Catholic private universities have adopted a “preferential option for the rich,” Beyer argues that too many Catholic colleges echo those institutions’ denial of access to the poor. “By the very nature of their mission, Catholic universities must fight against this trend,” Beyer said. 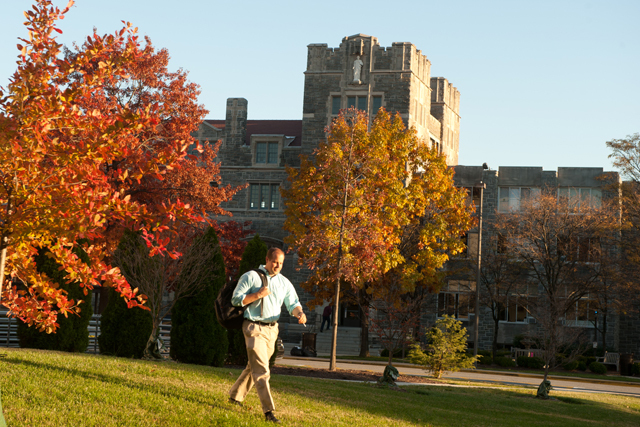 Jesuit Catholic colleges and universities in particular stress principles of social justice, but three of the order’s universities rank high on the list of colleges that accept few Pell students and leave them with high net costs: Saint Joseph’s University, Saint Louis University, and Loyola University Maryland. Lunardi added that the proportion of Pell students would be higher if 1,000 part-time students were included, since 40 to 50 percent of them are low-income, and that the net-price figures collected by the federal government and used in the report include only students who receive federal financial aid, not all students. Saint Louis University and Loyola-Maryland declined to comment. The University of Dayton, which is affiliated with the Marianist order, said that, since the 2011-12 academic year covered by the New America study, it has instituted a four-year guarantee that students’ net price won’t increase and has taken other steps that are beginning to result in the admission of more Pell students and less student debt. Of all the nation’s colleges, Catholic University is most closely identified with the institutional church. Its bylaws require that 18 of its 48 trustees be bishops. An annual collection in parishes across the country raises about $5 million for the university, which goes for scholarships issued through participating parishes.